Kew, Michael. "Northwest Coast Indigenous Peoples in Canada". The Canadian Encyclopedia, 16 October 2018, Historica Canada. https://www.thecanadianencyclopedia.ca/en/article/aboriginal-people-northwest-coast. Accessed 23 April 2019. 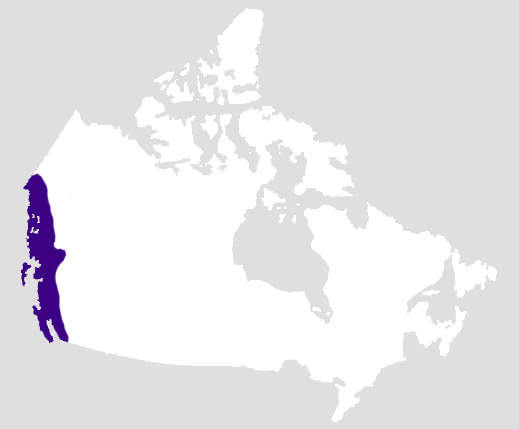 Indigenous peoples in Canada, both historical and contemporary, have inhabited six cultural areas that, unlike provinces and countries, do not have strict boundaries, and instead refer to areas in more general terms. 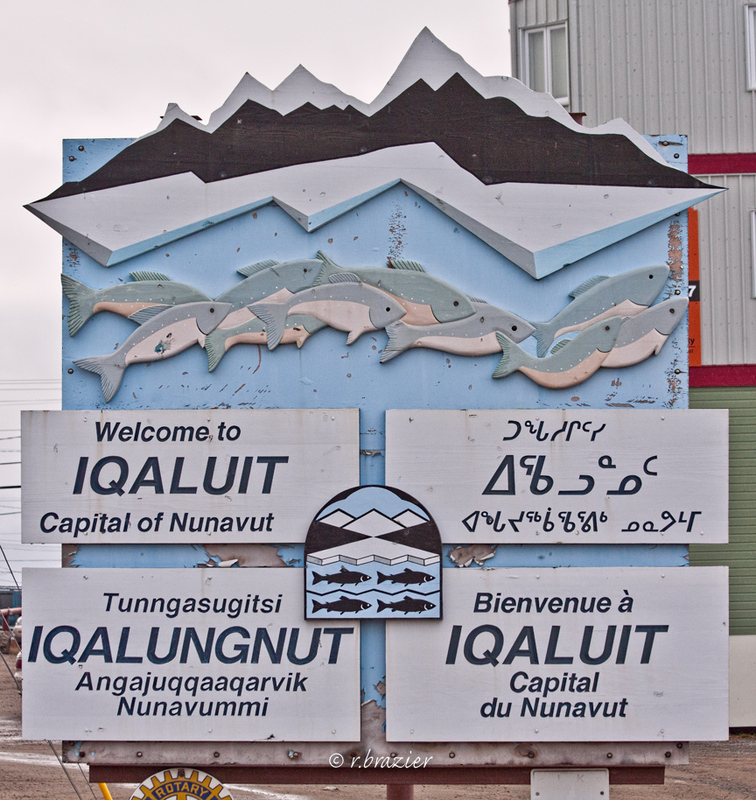 The Northwest Coast is one of these cultural areas. The others include the Plains, Plateau, Subarctic, Arctic and Eastern Woodlands. There are a variety of Indigenous nations living in the Northwest Coast. The Tlingit occupy territories from the northwest tip of British Columbia and the southwest Yukon to south of the Alaska coast. The Haida live on Haida Gwaii, a group of islands off the north coast of British Columbia. Along the Nass and Skeena rivers are Tsimshian-speaking peoples, including the Nisga’a and Gitksan (Gitxsan). Strung along the coast from Tsimshian territory to northeast Vancouver Island are the Haisla, Heiltsuk, Oweekeno (Rivers Inlet) and Kwakwaka’wakw. On the west coast of Vancouver Island live the Nuu-chah-nulth. The remaining peoples include the Coast Salish, a large grouping of Indigenous nations including the Central Coast Salish and Northern Coast Salish. Naturally, the cultural area of the Northwest Coast follows the northwestern coast of North America and slightly inland along the Nass, Skeena and Fraser rivers in British Columbia. The geography of the area, with inlets, fjords and archipelagos cut into steep rock that gives way to coastal mountains, ensured both an abundance of sheltered village locations while necessitating a maritime way of life. The earliest settlement of the Northwest Coast occurred probably around 14,000 years ago following the last ice age. (See also Prehistory.) Societies were established around hunting and gathering, with the most valuable resources being salmon (for food) and cedar (for construction, technology and artwork). Security of place and abundant resources allowed for the development of permanent settlements, and significant wealth and political complexity, despite the absence of an agricultural economy. 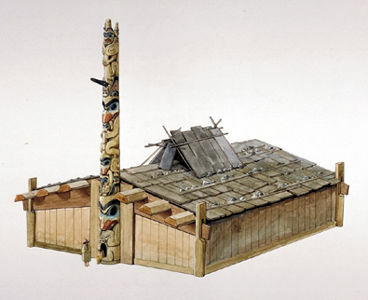 Archaeological discoveries, including artistically carved tools and decorative pieces from thousands of years ago, have led some archaeologists to declare that artistic and spiritual traditions like the potlatch have been practised on the Northwest Coast for over 5,000 years. Fishing, hunting and gathering were the means of subsistence on the Northwest Coast. Resources from the sea were of primary importance. The Pacific salmon runs, which arrived in regular annual migrations and provided salmon that were eaten fresh or dried for year-round use, were particularly significant. Fishermen adapted devices, such as nets, traps and weirs, to suit specific sea and stream conditions, as well as local occurrences of fish species. 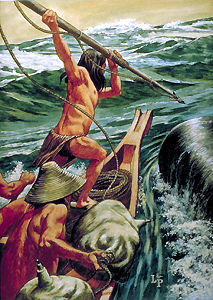 They used techniques such as trolling and jigging with baited hooks to catch fish, as well as harpooning and spearing in streams. Hunters took land mammals, including black-tailed deer, bear, wapiti (elk) and mountain goat, with bows and arrows, snares, deadfalls and nets. Sea mammals, including seals, whales and porpoises, were taken with harpoons on the water, and with clubs or nets wherever animals came ashore. The abundant waterfowl fell prey to a variety of nets. The people gathered additional nutrition in the form of shellfish, berries, edible roots, bulbs and green shoots. Resources were not evenly distributed in all regions, and coastal communities followed a migratory pattern or dispersed from winter villages to outlying sites as each resource changed with the seasons. While fishing and hunting were mainly the work of men, and women did most gathering of plant and beach foods, the division of labour was complementary and often co-operative. Both men and women made the tools necessary for work. As almost all foods were produced at times in quantities greater than immediate need, food was often preserved for leaner times. Men did most of the initial production of fish and game, but women did the cooking and preservation. Northwest Coast Indigenous people harvested straight-grained cedars for planks and boards for houses, chests and boxes. Huge trunks were carved into dugout canoes and totem poles. Carpentry was men’s work, and with blades of stone and shell, wooden wedges and stone hammers, they fashioned not only plank houses but other items of everyday use. 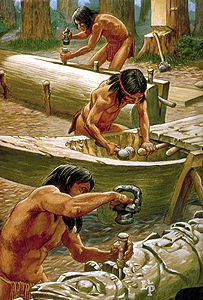 For example, craftsmen carved dugout canoes, which provided transportation along rapid streams and on the open sea. Women were responsible for making clothes for the family. Women twined cedar-bark skirts and cloaks for everyday wear. On special occasions, people in northern communities wore elaborately decorated Chilkat blankets of twined cedar bark and mountain goat wool. Coast Salish people twilled mountain goat wool supplemented by dog wool into heavy blankets with decorative borders. These were items of daily wear in cold weather. Everywhere on the coast, fur cloaks supplemented this stock of clothing. Women also created other everyday items, such as fishing nets and lines, out of twine that they spun. Women wove collecting baskets and exquisite, finely decorated hats from cedar bark and roots. They fashioned mats from cedar bark or rushes, providing furnishings and lining for houses for additional warmth. The primary unit of society everywhere on the Northwest Coast was a large group of kin who usually shared common ancestors. Among northern peoples, membership in the kin group was passed down through women, but in the south, membership could be claimed through either the male or the female lines. In both areas, the result was a core of close kin with spouses living together in a house or house cluster under the direction and guidance of capable leaders. These leaders held formal titles or prominent hereditary names within the family line and acted as managers of family property, including nonmaterial possessions such as names, ritual performances, special songs or secret knowledge. The foundation, however, was ownership of real property such as house sites, berry patches, hunting territory, seal rookeries and fish-trap sites. While some territory and waters were open to general use, more productive harvesting places were privately owned. Real property, combined with skilful management of family labour and individually owned capital equipment, enabled kin groups and their chiefs to achieve high productivity and accumulate tangible wealth. Property was the basis and vehicle of the Northwest Coast system of rank and class. In some communities there was precise status with internal ranking, while others had more flexible categories. An upper-lower distinction of some form was universal, as was the institution of slavery. Slaves were acquired in war or by purchase. Although they lived in owners’ houses, slaves lacked full civil rights and were required to perform menial chores. Villages were always close to navigable water, with houses positioned parallel to the beach facing the water. Although united by kinship, dialect and common interest in territory, powerful families governed villages. Among Coast Tsimshian and Nuu-chah-nulth peoples, strong village leaders extended their influence through the temporary confederation of winter villages. Feuding occurred in response to injury or trespass, and occasionally escalated into warfare. Acquisition of property, including slaves, was also a motivation for conflict. The practice of redressing wrongs with gifts, may have helped to limit the scale of warfare, which was nevertheless prevalent throughout the coast. High-ranking individuals from separate kin groups and villages found common cause in class membership and ritual associations, often termed “secret societies.” Most important of all were bonds of marriage and the gift exchanges that accompanied them. Marriages were contracted between people of different kin groups, often in widely separated villages. In order to validate lineage rights and maintain class position, assemblies of people from many kin groups were convened to witness claims at potlatches. At these ceremonies, hosts would feed and distribute gifts to guests. Though barter and trade occurred, gift giving and feasting were the major means of distribution and exchange of wealth. 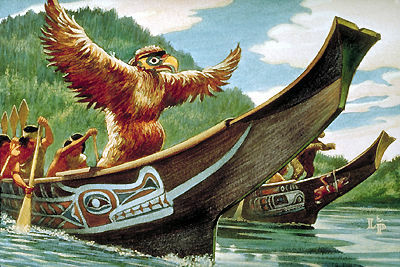 On a ceremonial dugout canoe, made from a single cedar log, costumed bird and animal dancers announce a potlatch. 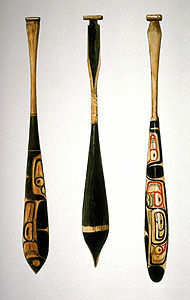 Northwest Coast Indigenous people associated music and decorative arts with both sacred and secular activities. Spirit helpers conferred songs, which were then used to transmit family and secret society traditions, often accompanying masked re-enactments of legendary or supernatural events. There were songs for all occasions: soothing infants, playing games, expressing love and sorrow. The voice was the primary melodic instrument, although percussive devices, whistles and horns were used as accompaniment. Enforced Westernization and assimilation -- the policy of missionaries and government administrators until the late 20th century – destroyed many Indigenous cultural practices. Compulsory education in centrally located residential schools, where traditional languages were forbidden, had devastating effects on the students as well as on community structure, socialization and languages. The Indian Act also banned cultural practices, such as the potlatch, from 1885 to 1951. However, feasts and ceremonial exchanges, especially among the Kwakwaka’wakw, never completely ceased and experienced revival toward the end of the 20th century. The few Coast Salish villages where spirit dancing survived have served as centres for a dramatic religious revival that has continued to attract followers. Though most Indigenous peoples of the region now speak English as a primary language, the Northwest Coast exhibits the most diversity in language of all the cultural areas in Canada. The languages spoken in this cultural area include Tlingit, Haida, Tsimshian languages (such as Nisga’a and Gitksan), Wakashan languages (including Haisla, Heiltsuk, Kwakwaka’wakw, Nitinaht and Nuu-chah-nulth) and Salish languages. 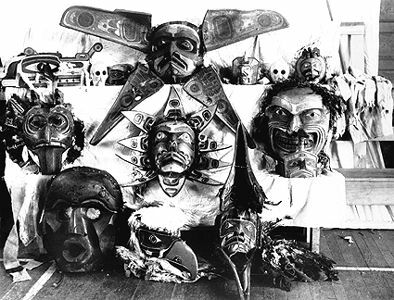 Confiscated masks and other goods that belonged to the Kwakwaka'wakw (Kwakiutl) people who attended Dan Cranmer's potlatch in 1921 at the village of Alert Bay, British Columbia. Among Northwest Coast Indigenous groups there was no strict segregation of the sacred and secular, as the sacred was implicit in all thought and action. Belief in potent spirits identified with animate and inanimate objects was fundamental. Spirits could interfere in human affairs, but by self-purification an individual might induce them to become personal helpers. These spirit helpers were a source of power for religious practitioners, or shamans, but also endowed ordinary folk with special competence or good fortune and, in some areas, became hereditary privileges. This awareness of power in the animate, nonhuman sphere was consistent with widespread use of prayers and welcoming ceremonies to foster the annual fish runs. The course of each person’s life brought changes of status as people received names, reached puberty or were married. Taboos, and elaborate ritual and feasting accompanied these events. Illness, while associated with physical causes, was also ascribed to soul loss or the intervention of spirit forces, and shamans were called upon for diagnosis and corrective treatment. Northwest Coast people believed in existence after death and in ghosts that could be harmful to the living. Funeral and memorial ritual served to separate the living and the dead, and to sustain, honour and appease the dead. (See also Religion and Spirituality of Indigenous Peoples in Canada). First contact with non-Indigenous peoples on the Northwest Coast may have occurred as early as the 16th century. However, interaction between Indigenous peoples and European explorers and traders began in earnest in the late in the 18th century. Major epidemics of smallpox, introduced by Europeans carriers, killed large numbers of Indigenous peoples in the 1770s, 1800s, 1830s, 1853 and 1860s, while other diseases dramatically reduced the population throughout the 19th century and early 20th century. A major smallpox epidemic may have killed 20,000 people in 1862, when, after infection broke out in Indigenous camps around Victoria, authorities forced them to their home communities, spreading the disease. When Spanish and British explorers opened the way for traders seeking rich stocks of sea otter pelts, Indigenous peoples adopted firearms, iron tools and other European goods. Permanent trading posts were established with a series of Hudson’s Bay Company (HBC) forts. By 1850, the HBC controlled the trade in the region. The discovery of gold on the Fraser River in 1857 brought a rush of miners and settlers to the newly established colonies. (See also Gold Rushes.) Indigenous peoples migrated to towns and forts from afar for trade goods. 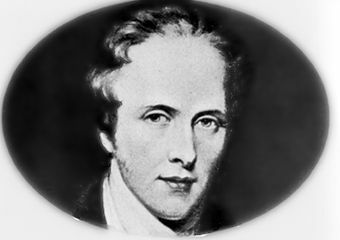 Governor James Douglas signed 14 treaties with Coast Salish peoples on Vancouver Island between 1850 and 1854. (See also Treaties with Indigenous Peoples in Canada.) This recognition of Aboriginal title, as well as the right to land and compensation for appropriation, was quickly abandoned as European settlement and development increased, and was forgotten entirely when British Columbia entered Confederation in 1871. Commissions were established in 1876 and 1912, and tasked with creating reserves. However, neither commission had the authority to make treaties or deal definitively with Indigenous grievances. Though reserves were imposed unilaterally and did not always meet the requests of Indigenous peoples, they did provide at least minimal legal protection for many village sites as the influx of settlers continued. Since the Calder case in 1973 and the launch of the Nisga’a nation’s historic land claim in the same year, First Nations in British Columbia have made progress in demonstrating Aboriginal title of their traditional lands and achieving self-government. Established in 1992, the British Columbia Treaty Commission has since facilitated negotiations of modern treaties with other First Nations in the province. Despite delays in the process, the Tsawwassen First Nation Final Agreement, the first urban treaty in the history of British Columbia, came into effect in 2009, and the Maa-nulth First Nations Final Agreement in 2011. The Maa-nulth treaty comprises the Huu-ay-aht First Nation, Kyuquot and Checleseht (Ka:’yu:’k’t’h’/Che:k’tles7et’h’) First Nations, Toquaht Nation, Ucluelet First Nation and Uchucklesaht Tribe, all part of the Nuu-chah-nulth Tribal Council. Northwest Coast Indigenous peoples have also taken to the courts to protect their land and rights. In 2004, the Supreme Court of Canada ruled in Haida Nation v. British Columbia and Taku River Tlingit v. British Columbia that the Crown has a duty to consult and provide reasonable accommodation of Indigenous interests in creating policies that might impact treaty rights. This duty arises even before treaties are established. Northwest Coast Indigenous peoples have created a variety of tribal councils and associations as a means of protecting Indigenous rights and land claims. For example, the Nuu-chah-nulth Tribal Council (founded in 1958), the Tsimshian Tribal Council (1988) and the Coast Salish Gathering (2005) serve the specific interests of the respective communities, focusing on a range of socio-economic and political issues. Nora Marks Dauenhauer et Richard Dauenhauer, éds., Haa Kusteeyí, Our Culture: Tlingit Life Stories (1994). Jay Miller, Tsimshian Culture: A Light Through the Ages (1997). Douglas C. Harris, Landing Native Fisheries: Indian Reserves and Fishing Rights in British Columbia, 1849–1925 (2008). Alan L. Hoover, ed., Nuu-chah-nulth Voices, Histories, Objects & Journeys (2000). Dennis Horwood, Haïda Gwaii: A Guide to BC’s Islands of the People (2016). Nora Marks Dauenhauer and Richard Dauenhauer, eds., Haa Kusteeyí, Our Culture: Tlingit Life Stories (1994). Dennis Horwood, Haida Gwaii: A Guide to BC’s Islands of the People (2016). TSAWWASSEN FIRST NATION Learn more about this self-governing First Nation. MÂTS TOTÉMIQUES Informationfournie par Affaires autochtones et du Nord Canada sur l’importance du rôle desmâts totémiques dans les cultures de la côte nord-ouest. MAA-NULTH FIRST NATIONS Read more about the Maa-nulth treaty and its signatories. MUSEUM OF ANTHROPOLOGY The website for the Museum of Anthropology at the University of British Columbia. Features online exhibits and a First Nations of British Columbia map. Canada’s largest teaching museum is best known for its extensive Northwest Coast First Nations collections. TOTEM POLES Indigenous and Northern Affairs Canada provides information about the cultural significance of totem poles in Northwest Coast cultures. TLA’AMIN NATION Learn more about the Tla’amin lands and their modern treaty settlement.